The opening scene is a prequel to the main characters’ story. A warrior is escaping a violent alien coup with two young children, the infant heir to the royal throne, and a young unidentified boy. ~20 years later the main story begins in a restaurant where the reader is introduced to Veil, a young American man, who finds a cell phone. But it isn’t a normal cell phone, instead it is linked directly to another phone and to one young woman, named Nikki. Nikki has been kidnapped and locked away by a man who claims to be an alien, and has told her that she is as well. He left her in the subway system under London, to find the “other” one. So begins an escape attempt, where Veil flies to England to free Nikki, and flees with her into the British countryside where they grow close and develop a romantic relationship. Mysterious men attack and try repeatedly to kill them, until the man who kidnapped Nikki finds and rescues them. He claims that he is a Paladin. A royal guard who hid the two children on earth years ago, and has returned to take them home, back to the planet of their birth. The meat of the story begins at this point, when they return home, and Nikki is revealed as that long-lost royal infant. Veil, as her hereditary bodyguard, a man who she is forbidden to marry, and who is expected to secure her throne and her future. 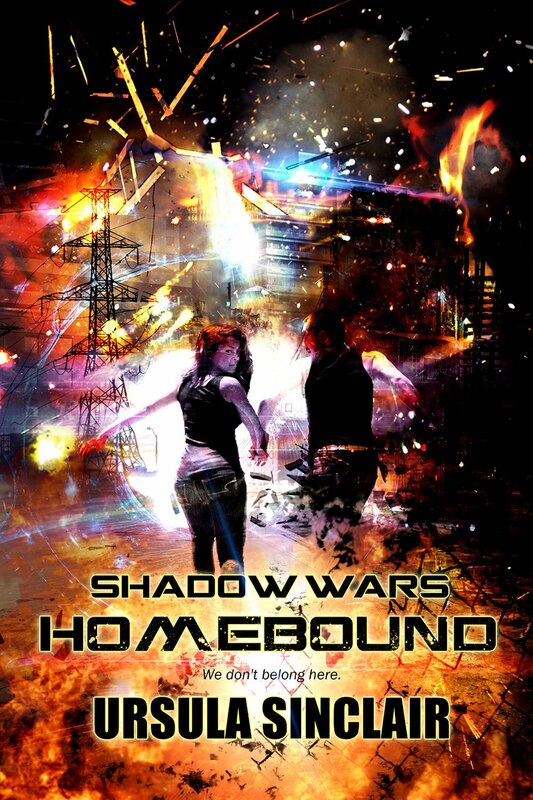 Shadow Wars: Homebound is the first NA science fiction story that I have read that follows this fairly typical YA fantasy plot line. Characters who believe they are normal humans, but then turn out to be the only chance to save a world or reality that they know nothing about. Because it is such a familiar tale, the science fiction in the story will be more accessible to fantasy, paranormal, and even contemporary NA readers. This world’s technology was very interesting with computer-like circuits being integrated into the minds of all citizens, allowing them not only to download massive amounts of information, but actually allowing them to directly connect to technology, and altering the behavior of the royal family slightly to insure they do what is best for their society. The book is fast paced, action packed, and includes the deep angst and coming of age subplots that are expected in New Adult or Young Adult romance. The forbidden love aspect is explored well, and so are the two primary characters. The structure, progression, and plot of the story was a little TOO familiar and predictable for me. I do however caveat that with the fact that NA, New Adult, is an age category that I have limited experience with and that I am not the target audience for. Even within the more established YA category, I have only a few books that I enjoy, and it is in my experience, more common in both these categories to have plots and characters that follow this specific framework. There was little development of secondary characters, who also died with a disturbing frequency, and with limited emotional impact. Even the villains who were the underlying cause of all the events in the book, were a mysterious and uncertain threat. Later books in the series might explore them in more detail, but except for them trying to kill Veil & Nikki repeatedly before they moved to their home planet, they played a very minor role, and were too easily driven back, to be the scary alien threat I believe they were intended to be. I managed to like this book, even though I felt it was too obvious and predictable. The interaction between Veil & Nikki was enjoyable, as were the coming of age and forbidden love aspects of the romance. The science fiction technology was unique and developed well. As a whole, it was a good story and interesting concept. The ARC I received was not the final edit, and as such the issues with editing have been ignored for the purpose of this review. However, it is worth noting that there were some substantial POV and tense issues that I would have downgraded the story for in a final copy. It is my assumption that these have been corrected prior to the book’s release.